Can we call this a Blackhawks dynasty? 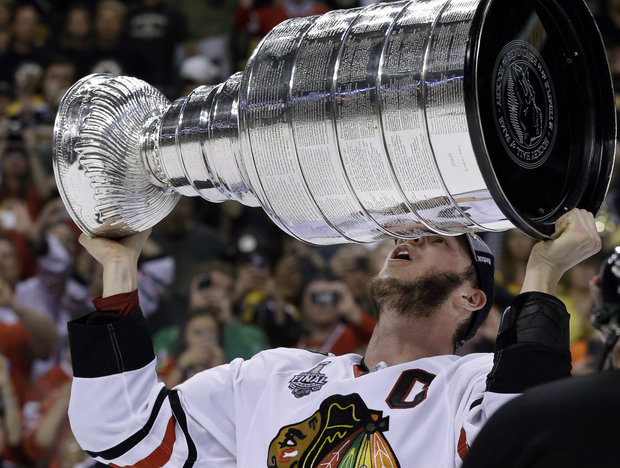 Jonathan Toews hoist the Cup for a second time-is there more to come? Could there be more future Cup hoisting for the Blackhawks? Can we dare say this Blackhawks team may be turning into a dynasty? Winning the Stanley Cup in 2010 and now 2013 is a very good indicator that this team is on the right track. It is up to the club’s front office led by Stan Bowman with a lot of input by his highly regarded father, Scotty Bowman. After 2010&apos;s win, Bowman had to make difficult decisions to shed players and payroll to meet the hard salary cap. Gone were very important cogs to that title: Dustin Byfuglien, Andrew Ladd, Kris Versteeg, Troy Brouwer, Brian Campbell, Tomas Kopecky, Ben Eager, Adam Burish and Antti Niemi. The most important aspect was keeping the team’s core players in place: Patrick Kane, Jonathan Toews, Patrick Sharp, Marian Hossa, Dave Bolland, Duncan Keith, Brent Seabrook and Niklas Hjalmarsson. Hjalmarsson was a restricted free agent after the 2010 season and the Blackhawks matched the San Jose offer to retain the young defenseman. Now the club has a similar scenario: Nick Leddy is also a young, restricted free agent. His quickness is a huge asset and he has room to grow. The other big decision is what to do with free agents Bryan Bickell, Viktor Stalberg and Ray Emery. Bickell, a former second round draft pick, had a heck of a post season. He scored nine playoff goals, including the game tying goal, in the now famous 17 second scoring spurt of the deciding Game 6. The game winner by Bolland could be his last as a Hawk. There has been speculation that he could be traded. So again, Stan Bowman has the tough task of tinkering with his newly crowned championship roster. Last year he stood pat with his club and made one deal at the deadline that didn’t seem significant: acquiring Michal Handzus. The 36-year-old center had some good moments during the playoffs. It was very touching to see Toews make the first handoff of the Cup to the veteran Handzus. Now the core of the team has capture two titles. And Kane is just 24; Toews is 25. Both have won the Conn Smythe Trophy and once coach Joel Quenneville put them together on the top line their production was a major factor for winning. Patrick Sharp led the NHL with 10 post season goals. He rebounded well after suffering a shoulder injury during the regular season. Seabrook and Keith were stellar with their defensive play. Seabrook snapped out of a bad stretch early in the playoffs. One of the reasons, beside roster issues, that the Hawks can be a dynasty is the man behind the mustache: Quenneville. He made adjustments with his lines, he sat players that needed to realize playing time is tied into good play and he didn’t make excuses. During the strike-shortened season, the Blackhawks coach did a masterful job of resting his players with limited practices. He used both his goalies, Corey Crawford and Ray Emery, with the condensed schedule. Once Quenneville settled on Crawford for the playoffs (Emery’s injury made the decision easy), he remained a strong supporter to his young goalie. In my mind, Crawford had only one glitch in the playoffs, Game 5 of the Stanley Cup and he won. The Hawks goalie really should have won the Conn Smythe Trophy. His role was very significant for all of the playoffs. This isn’t a knock on Patrick Kane. But to me Crawford had the toughest job and came out on top. During the season, the team has developed some young players to add to their core, Brandon Saad (20), Andrew Shaw (21), Marcus Kruger (23) and Michael Frolik (25). Kruger and Frolik have become a great duo on the penalty kill. There are also some players to watch on the Rockford minor league team. So maybe the Blackhawks can bank a few more Stanley Cup victories in the years to come. Maybe we have a dynasty in the making in Chicago.